Hyped are proud to announce they have been awarded funds from Innovation Initiative Grant, as well as a cash award, providing a modest, but comfortable budget to continue their research, development and testing. The group are keen to welcome new people and fresh ideas from mechanical, electrical and civil engineering as well as those who would be keen to help with outreach and marketing. Hyped is an interdisciplinary student project group focused on Hyperloop - a transportation technology concept from Elon Musk. 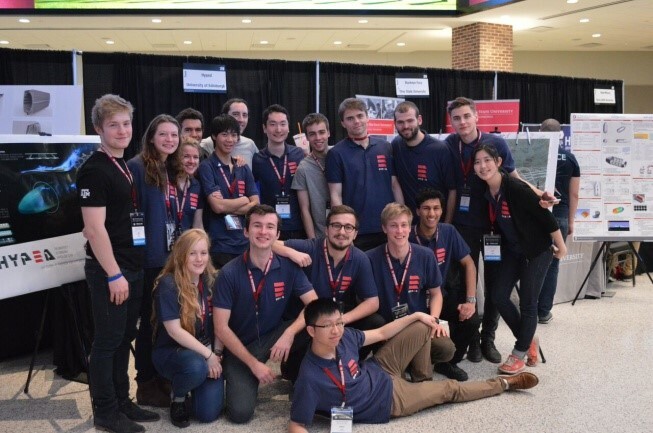 The research group formed last year, participated in the Hyperloop competition in Texas and received an award for subsystem design. Having generated a lot of publicity and interest in 15/16, the team are continuing the Hyped project by researching particular subsystems and elements of Hyperloop and by participating in the competition again next year. Although probably most of activity will start as the next term begins, Hyped will kick-start during the summer and then develop ideas in 16/17 academic year. Therefore, if you are a member of staff, postgraduate or undergraduate student of any engineering related discipline, please get in touch with Hyped by email (team@hyp-ed.com) to "help change the world together!"